Find hotel near Maisonnatale Jean-francoi ..
MaisonNatale Jean-Francois Millet (The birthplace of Jean-Francois Millet) is located in the town of Greville-Hague. The site has been restored and is now open to public. It evokes the childhood and training period of the painter, and a collection of drawings and preparatory sketches is on exhibit allows having a close look at the artist’s techniques. The place is managed and run by the General council. A showroom at the site temporarily hosts a temporary exhibition of the work of artists inspired by the works of Millet. A film tracing the life and work of the painter is on display at the site as well as the visitors get to relive the incredible story of one of his most famous paintings, The Angelus. 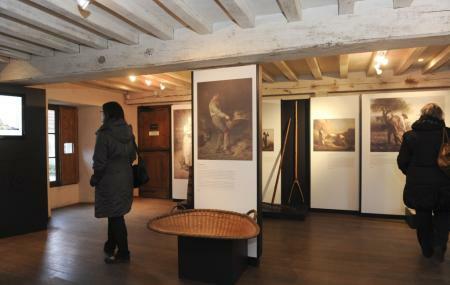 Temporary exhibition: works of artist’s inspired by Millet’s artwork. Reinterpretations by the likes of Van Gough. Last ticket sale 1 hour before the closing time. How popular is Maisonnatale Jean-francois Millet? People normally club together Jardin Botanique Du Chateau De Vauville and Jardins En Hommage A Jacques Prevert while planning their visit to Maisonnatale Jean-francois Millet. Un balade dans le temps pour découvrir un peu de passé à travers M Millet. Un arrêt qui vaut le détour si vous visitez la région.